Normally, I cook this pork joint in the slow cooker and serve it as pulled pork. But there was no way that this monstrous beast would fit in the slow cooker, so there was nothing for it but to use the oven. Using the oven was a good choice because the skin was transformed into the most deliciously crunchy crackling, and the meat was tender and flavourful. It was so tender that it was literally falling off the bones and could be shredded with 2 forks! This does take quite a time to cook, and some advance preparation is needed, but most of the cooking time (around 8 hours in total!) is non-work time. You can put this in the oven, and apart from checking on it a couple of times, literally forget about it. 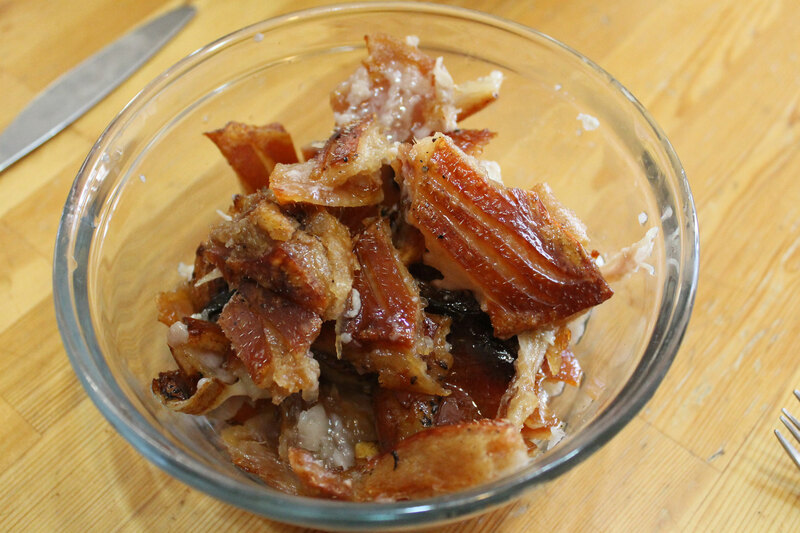 Your house will be infused with a wonderful porky aroma, and by the end of the long, slow cooking, you will have a delicious pork joint to serve and a roasting tin contaning some wonderful rendered lard that you can save to use for cooking other dishes. I ended up with half a quart sized mason jar of lard from this one joint! If saving the lard for cooking, make sure you use pastured pork as that has a more preferable fat-profile and is rich in vitamin D.
I loosely based this on Jamie Oliver’s 6-hour slow-roasted pork shoulder, although my pork shoulder was more than twice the size of his. 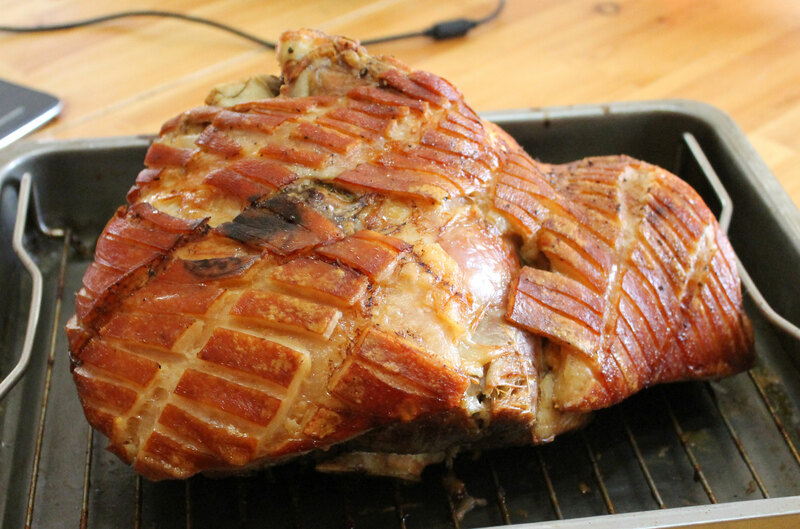 Several hours before you want to cook your pork shoulder, take the meat out of any packaging and dry the skin very thoroughly with paper towels – dry skin will form better crackling. Leave uncovered in the fridge for as long as possible as this will ensure that it dries out even more. Remove the pork from the fridge and allow it to come up to room temperature for aprox. 30 minutes. While the oven is preheating, you need to score the skin, going through to the fat layer, but being careful not to go so far as to reach the meat. The easiest way to do this is to use a scalpel blade, but a very sharp knife will work well too. Be warned – pig skin can be very tough, and if your knife is not sharp enough you will find it almost impossible to get through the skin without using so much force that you accidentally cut into the meat. I buy the scalpel blades I use for scoring pig skin from Ebay. (I also use them to score the skin when I cook my crispy pork belly). Rub some sea salt into the score marks, pulling the skin apart if you need to (this also encourages the skin to form that delicious crispy crackling that we are after). Turn the shoulder upside down and season all the meat with some more salt. Now place the shoulder on an oven rack sat in a roasting tray, skin side up. Place the tray with the pork in the preheated oven, which should be up to the correct temperature by this time. Remove from the oven and baste the skin with some of the fat that will have accumulated in the bottom of the tray. Now cover the shoulder with a sheet of parchment paper, and cover that with a sheet of aluminum foil – the purpose of the parchment paper is to prevent any leaching of the aluminum from the foil into the meat. Reduce the heat in the oven to 170°C/325°F and cook for a further 7 hours until the internal temperature of the meat is 71°C /160°F when measured with a meat thermometer inserted into the thickest part. Be careful that the thermometer does not touch a bone as they will conduct heat and give you a false reading. I like to insert my meat thermometer into at least 3 different areas of the meat. If all 3 readings are at or above the recommended temperature I can be sure that the meat is done. Remove the foil and parchment paper, baste the skin well with any fat that has accumulated in the roasting tin and return the shoulder to the oven. 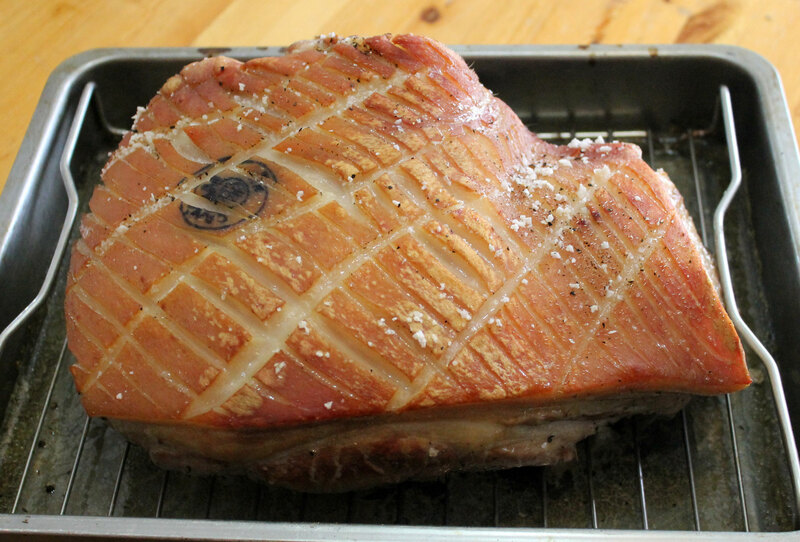 Turn the oven temperature up to 200°C/400°C, and cook the joint until the crackling is crisp and golden brown. Remove the shoulder from the oven and allow to rest in a warm place for at least 30 minutes. And then pulled the meat off the bones using 2 forks. It was so tender that it was literally falling off the bone. I served this with roasted sweet potatoes and beets (roasted in some of the fat that was in the roasting tin from the pork), caramelized onions and apples, and some steamed broccoli and cauliflower. And it was delicious! Don’t forget to give everyone some of that crackling! I also poured off all the rendered pork fat that was left in the roasting tin, and saved it to use for cooking. I also froze any leftovers for use in other meals. This entry was posted in Autoimmune Protocol Foods, Recipes and tagged AIP freindly, crackling, gluten-free, oven-roasted, paleo, pork roast, primal, slow roast shoulder. Bookmark the permalink. Ohhh, this looks so yummy! And all you seasoned it with is sea salt and pepper! Wow! Brilliant tips in this! Parchment before the foil. A scalpel. Blot and keep in fridge to dry out the exterior for a nice crust. Just so happy to learn these little tricks!